Can I just start by saying no one is paying me to write this book review. I just had to do it. When something inspires you this much, you really shouldn't keep it to yourself. To be honest , I didn't even want to read True Spirit. When my dad brought it to the beach house on our recent holiday and said I should read it I was sarcastically like 'oh yeah, cos I'm SO good at reading books lately, like I really have spare time for this!' 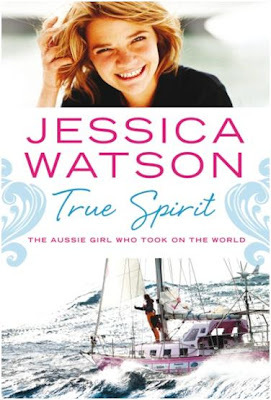 Dad then mentioned that parts of the book are written with excerpts from the blog Jessica kept of her seven-month journey at sea. My ears pricked up. Blogs? I can do blogs. Suddenly, I wasn't quite as hesitant. Still, I thought I knew all I need to of the story. Young sixteen-year old Aussie girl wanting to sail around the world cops massive media flak for colliding with a ship on a training run. Many say this is just another reason she shouldn't be contemplating a non-stop unassisted solo sailing around the world. She's too young. Her parents are exploiting her. It's madness. The list goes on. Close your eyes. Imagine for a moment, you are twelve years old again. Think back to what you were like at this age. For me, it was all about hanging out with my school and church friends and most probably annoying the heck out of whatever boy I was hoping to hang around with at the time. Jessica, not so much. She was already visualising herself out on that ocean in her boat being the youngest person to sail around the world non-stop. Imagine birthing a dream this big at age twelve. Imagine visualising yourself braving Southern Ocean storms on your own. She was. It was a four year dream in the making. It would be four years before Jessica left Sydney harbour on Ella's Pink Lady to finally live her dream. And this was the same girl who was scared to jump in a swimming pool at age 5. Who wasn't even that thrilled about sailing when she started out. A girl who has battled with dyslexia all her life. Who is pint-sized and looks like a big puff of wind could knock her over. But this is the same girl who sailed through a storm in the Atlantic Ocean that knocked her boat down four times and even tipped it completely upside down at one point. Jessica didn't lay eyes on another human being for seven months. She maintained every little piece of equipment on Ella's Pink Lady, fixed everything that broke, cooked her own meals, baked, listened to her favourite music, blogged and recorded video diaries along the way. Jessica returned to Australia after her seven-month journey to a hero's welcome. She was welcomed home on the steps of the Opera House by the Prime Minister himself. And has recently been named Young Australian of the Year. Parent, you have to believe in your kids dreams no matter how wild and crazy they might seem. Who are we to squash their world changing ideas just because our faith is only a mustard seed when theirs is as big as a mountain! If a girl half my age can sail alone around the world, what am I capable of if I just dared to dream? What dreams am I putting off today because there might be hard work involved? This dream was not a solo effort. There's a saying, 'if you build it, they will come' from the film Field of Dreams. Jessica's dream took literally hundreds of people helping to make it happen at all. But what an amazing journey to be part of. Along the way she managed to convince even the stoics who were unconvinced - including her dad that she could make her dream reality. Jessica was not a hero, just a girl who had a dream. Who DARED to dream, and who made her dream a reality through a lot of hard work and determination. You can read more about Jess at her website www.jessicawatson.com.au or watch video diaries of her journey here. One of the most beautiful gifts in the world is the gift of encouragement. When someone encourages you that person helps you over a threshold you might otherwise never have crossed on your own. Twenty years from now you will be more disappointed by the things you didn't do than the ones you did. So throw off the bowlines. Sail away from the safe harbour. Catch the trade wind in your sails. And read this book if you can! Wow...I probably would never have even considered reading this book because of my own prejudgments. She sounds awesome. Will add it to the list of biographies I need to read. Would you believe they've just said on the news here in Sydney that Jessica is announcing her next big project today. Good timing to post this review! Sounds like a great read. Have to admit, hubby & I were huge doubters and both admitted how wrong we were when she returned. I watched the whole arrival into Sydney on tv that day, very exciting! Might have to pay a visit to my library.. I'm with Jacksta - I wouldn't have given it a thought, but now I'm intregued! I will look for it at the library!